Step into the pages of the UK’s favourite bridal magazine from 30 September – 2 October! Brides The Show brings together the very best of the bridal industry at The Business Design Centre this Autumn – making it the only place to cross off your wedding to-do list in style. The Brides The Show catwalk will this year take on a captivating Circus theme, featuring the latest collections from designers including Suzanne Neville, Charlie Brear and Halfpenny London, PLUS exclusive to the Friday Night Preview, there will be an America’s catwalk showcasing seven top American designers including Monique LHuillier, Galia Lahav and Mira Zwillinger. Be inspired by a crafted selection of hands-on workshops in the Imagination room and interactive travel hub Dream Destinations. Meet bridal experts who will help you plan your big day, and discuss bridal looks with the Bobbi Brown Pro-team and Michael Van-Clarke hairdressers. 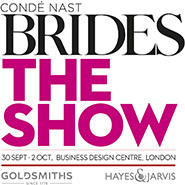 To book tickets visit www.bridestheshow.co.uk and quote ‘PARTNER’ to get 2-for-1 on tickets.